I’m afraid there is just no contest right here. 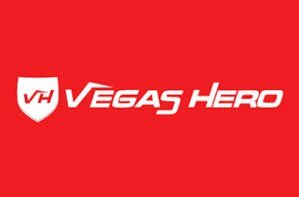 Vegas Hero is home to one of the best websites in the world of online casino and offers a sleek and straightforward interface which is complemented beautifully by a classy livery and excellent navigational journey. And Pots of Luck, well, doesn’t. 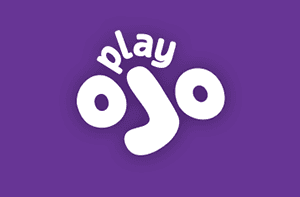 It’s not a particularly bad site, it’s just very basic and doesn’t fill you with all that much confidence that it will provide you with a great gaming experience. The fact that the promotions, support, FAQs and payment pages all load as pop-ups also adds to that unprofessional and slightly untrustworthy feeling. So no surprise for you here as Vegas Hero goes 1-0 up early doors. 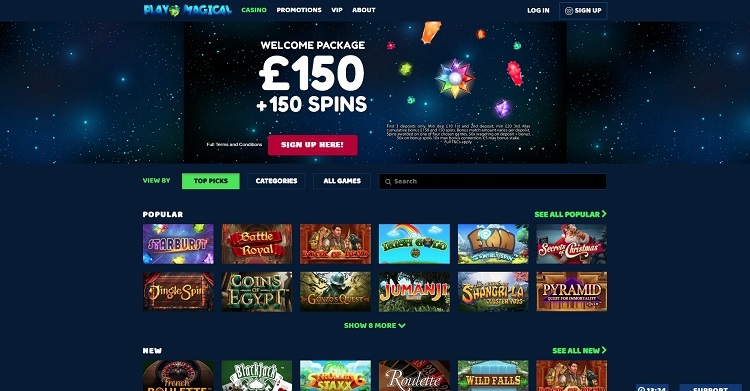 Pots of Luck offer quite a decent selection of across their site and their categories are being populated with more classics every week. 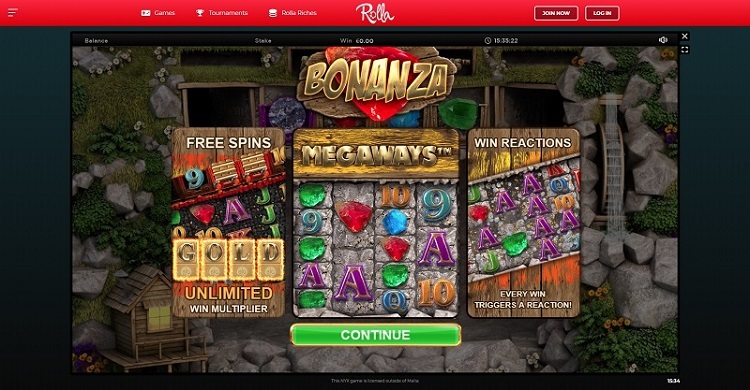 Currently, there are over 300 games on offer and that includes classics like Starburst, Bonanza and Rainbow Riches. 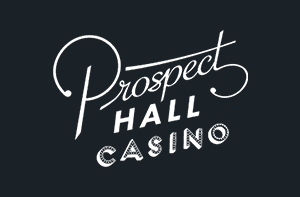 There’s also progressive slots in the shape of Mega Jackpots plus a whole host of table games and live casino too. But unfortunately, that selection is bested by a much, much wider array of games at Vegas Hero. 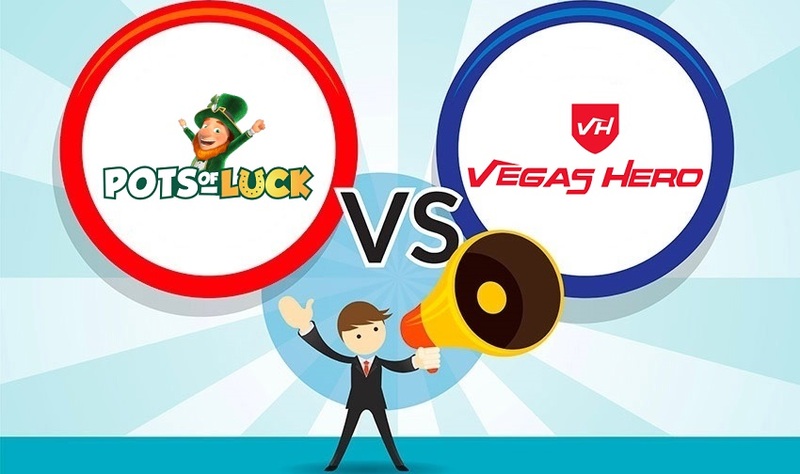 As of now, Vegas Hero offer over four times the selection of Pots of Luck, and they actually offer better games too including the likes of Mega Moolah and Mega Fortune which are hugely popular in the gaming arena. So though Pots of Luck haven’t done a bad job, there is only one winner. 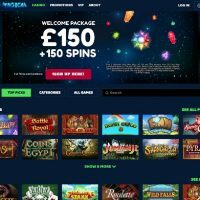 I’m afraid this is getting a little one-sided, and it’s a shame because Pots of Luck’s welcome offers really isn’t bad at all: 100% match up to £100 + 100 spins on your first deposit, 200% match up to £50 + 50 spins on your second, and 50% match up to £200 + 25 free spins on your third deposit. 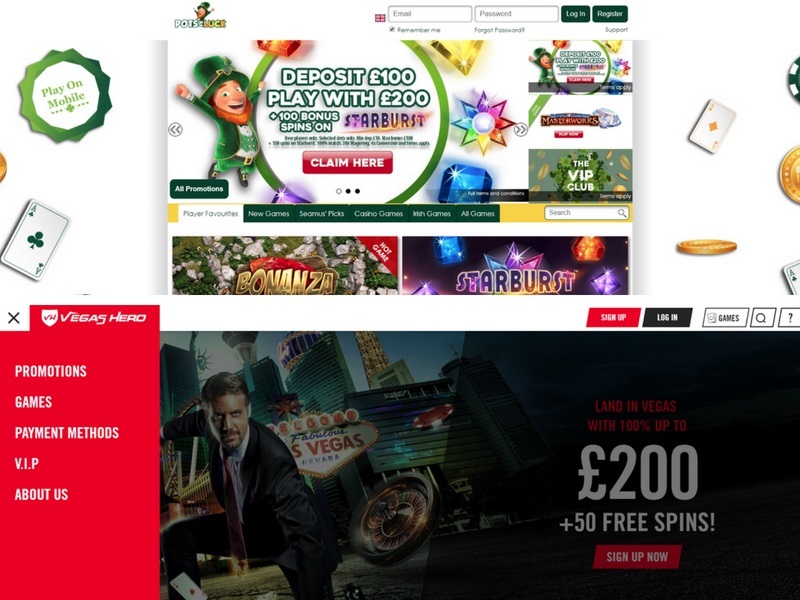 The problem is, Vegas Hero just go even better than that and here’s how it goes: 100% match up to £200 + 50 free spins on your first deposit, 50% match up to £200 on your second, 25% up to £300 on your third, and 25% up to £300 on your fourth. 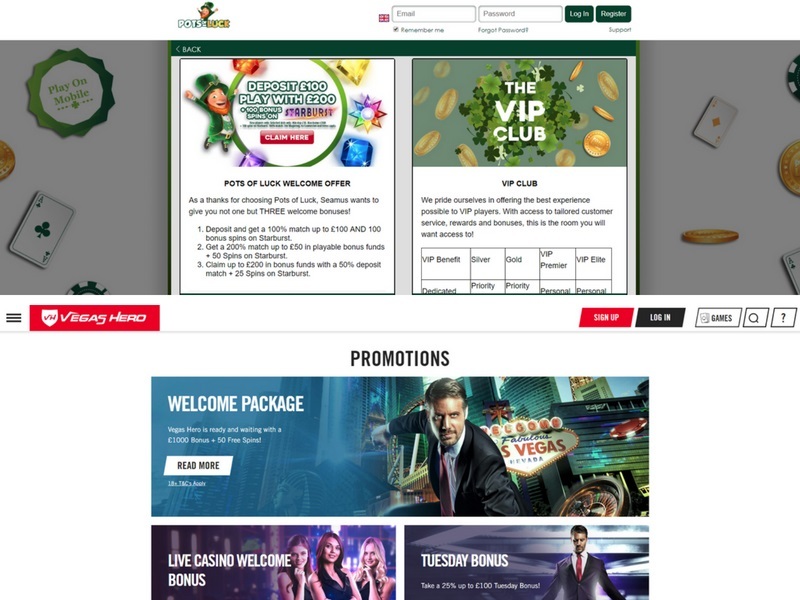 You also get continuous promotions too like 25% deposit bonuses on Tuesday’s, weekend bonuses and live casino bonuses. You just don’t get that with Pots of Luck. So, I’m sorry to say Pots of Luck, it’s another victory for Vegas Hero. This might be a close round, we’ll start with Vegas Hero. 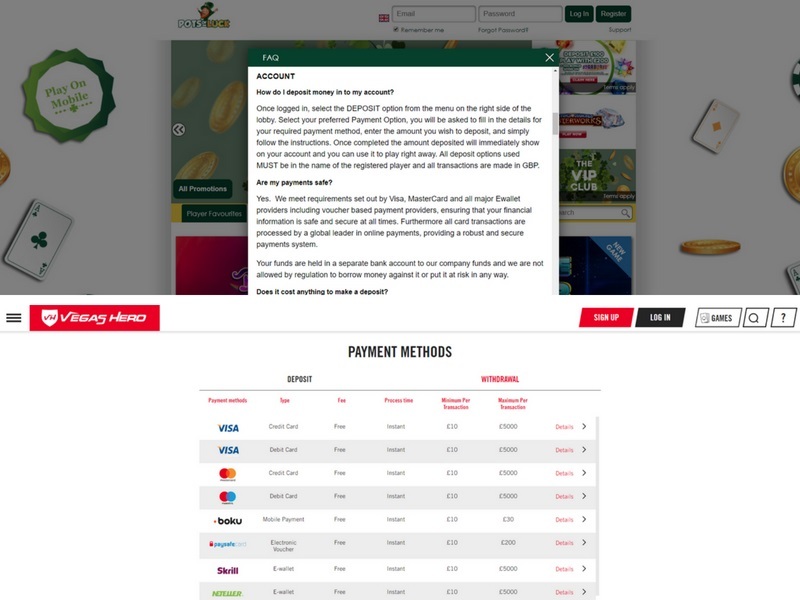 Regarding the payment methods, we’ve got Visa, Mastercard, Maestro, Neteller, Skrill, Boku, paysafecard, ecoPayz, Trustly and entropay. 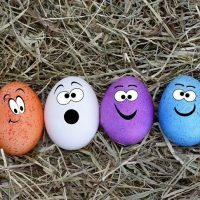 They all have minimum deposit and withdrawal of £10, the maximum deposit if £5,000, and the maximum withdrawal is £1,900. Pots of Luck? Well, we have Visa, Mastercard, Maestro, PayPal, Skrill, Neteller, Trustly, Boku and Zimpler. Minimum deposit is £10, minimum withdrawal is £20, and the maximum withdrawal is £2,000. So, a pretty even smattering that one. But I think the win has to go to Pots of Luck just because they offer the convenience of PayPal. 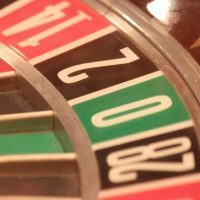 It’s quite elusive in casino circles, so it’s a pretty big thing to have. It’s a pretty comprehensive win for the heroes of Vegas. Pots of Luck did pull one back late in the day, but it wasn’t enough to stop Vegas Hero steaming forward to victory. To be honest, Vegas Hero is one of the best casinos out there at the moment. 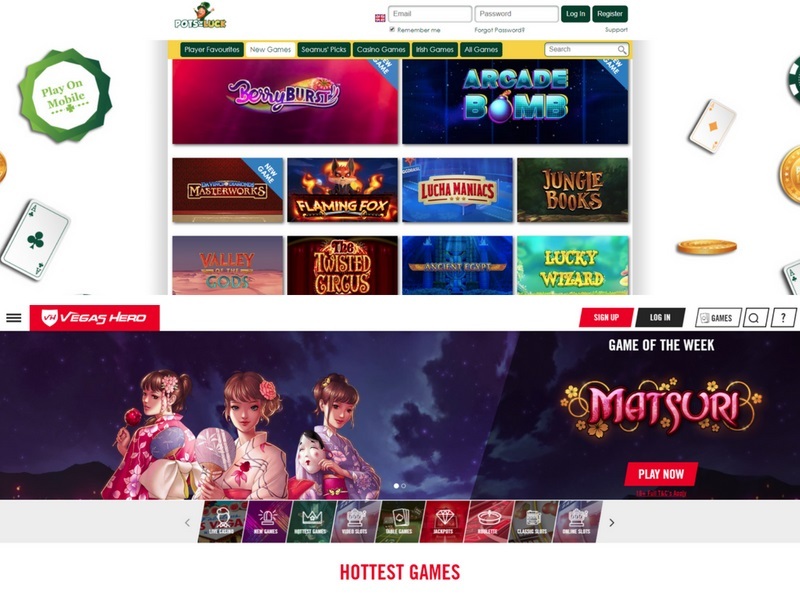 It not only offers a quite wonderful website but even when you drill down into the nitty-gritty you find that everything else is also top class with over 1,200 games on offer and 24/7 customer support just two of its ever-impressive qualities. Pots of Luck though don’t do a bad job but it’s just a shame that their website looks so basic because it gives off that feeling of unprofessionalism and untrustworthiness. Maybe I’m being a little harsh, but that’s just the way I feel and I’m not going to repress my feelings, no siree! But hey, they’ve got a very decent welcome bonus and decent games, so they’re worth checking out. But if you’ve only got time for one, make sure you head on down to Vegas Hero. You won’t regret it!